Biography & Genealogy: Layfayette Penn Rodes, Class of 1870: Genealogy: Born- April 2, 1848 in Lynchburg, Va. Father- Gen. David Rodes of Albemarle Co. Va. Mother- Fanny Louisa Penn. Pat. Grandfather- Matthew Rodes; Pat. Grandmother- Ann Blackwell. Mat. Grandfather- Robert Cowan Penn; Mat. Grandmother- Lucy Steptoe. 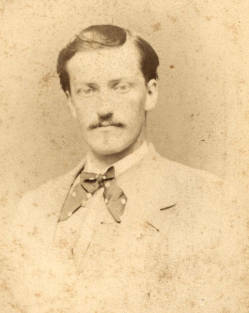 Lafayette Rodes was the half brother (same father) of Gen. Robert E. Rodes (VMI 1848) and Virginius Rodes (VMI 1843). Marriage: to Laura Carter Ambler on July 11, 1883; she was the daughter of John Jacquelin Ambler; she died November 8, 1891. Children- 1- Laura Beverly Rodes, who married James Dexter Hobbie Jr.; 2- Frances Jaquelin Rodes; 3- Ella Ambler Rodes, who married James Booker Hutter. VMI Record: Entered VMI- Sept. 11, 1866; Graduated July 4, 1870 standing 47th in a class of 52. Military Record: Unofficial source says he served in Kirkpatrick's Battery, C.S.A. during last year of Civil War, before entering VMI. Occupation: Civil Engineer; City Engineer of Lynchburg, Va. Death: May 11, 1900, Lynchburg, VA. Died- May 11, 1900. Buried Spring Hill Cemetery, Lynchburg, VA.